Square Enix's latest RPG Octopath Traveler is shaping up to be everything genre fans have been waiting for. Old-school JRPG action is making a return in Octopath Traveler, the latest title from the RPG experts at Square Enix. 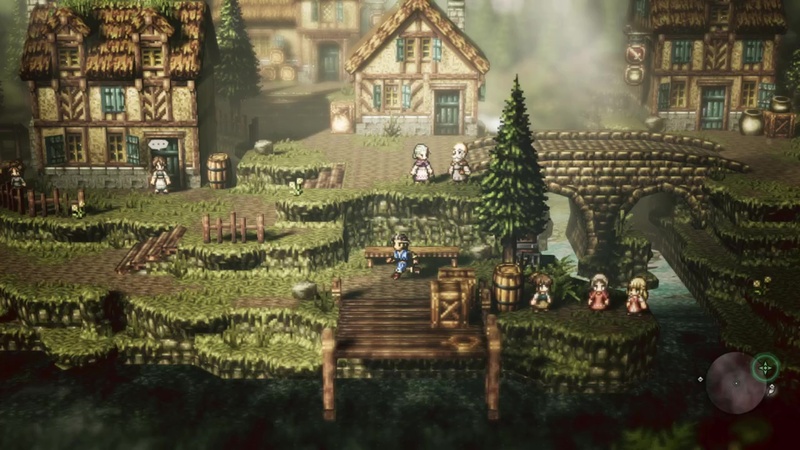 Billed as having an "HD-2D" art style that combines current-generation visual effects with 16-bit sprite animation, Octopath Traveler is an experience meant to blend the best elements of yesteryear's biggest gaming hits with all the modern touches that players expect from a new release. Does it succeed in its goals? In a word, absolutely. 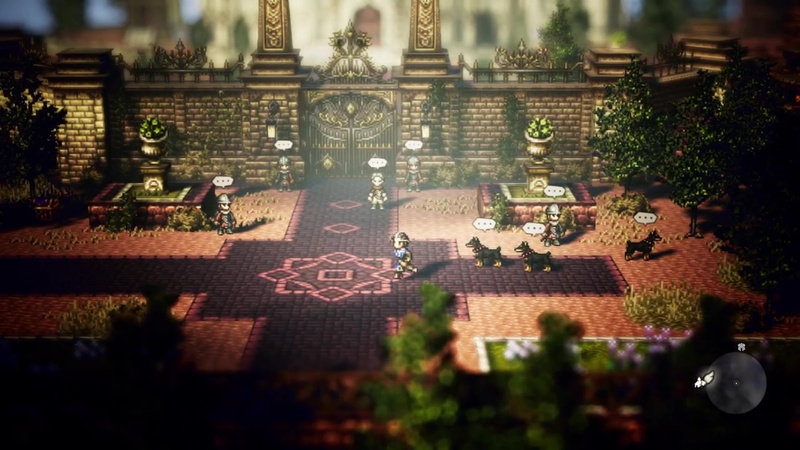 Octopath Traveler nails just about everything players expect from retro RPGs, from long-winded dialog-driven cutscenes to a fantastic, simple-but-strategic battle system. 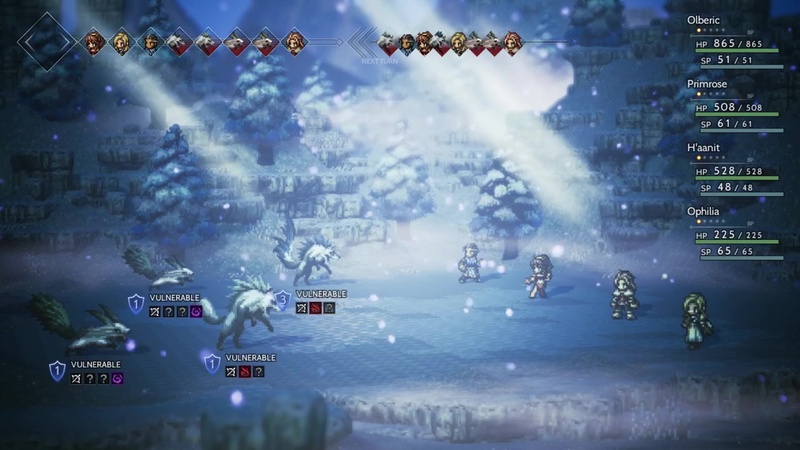 The world of Octopath Traveler is laid out in a style often seen in the Metroidvania genre, where branching environments connect major hub points that lead to both small secret areas offering treasure or larger pathways filled with more powerful enemies. Dipping into the latter areas is a great way to earn large amounts of experience, but also an easy way to get the entire party wiped out. Fortunately, a danger level is given at the beginning of each passage, serving as indicator for how powerful the player ought to be before trying to advance further. The overall mission structure follows a similar pattern: each of the eight main characters can be unlocked in one of the main hub cities, and once their first chapters have been completed, the following chapters can be found in locations not too far off the main paths. This recipe continues down further paths, with stronger enemies appearing in the wild and more powerful equipment showing up in later shops. 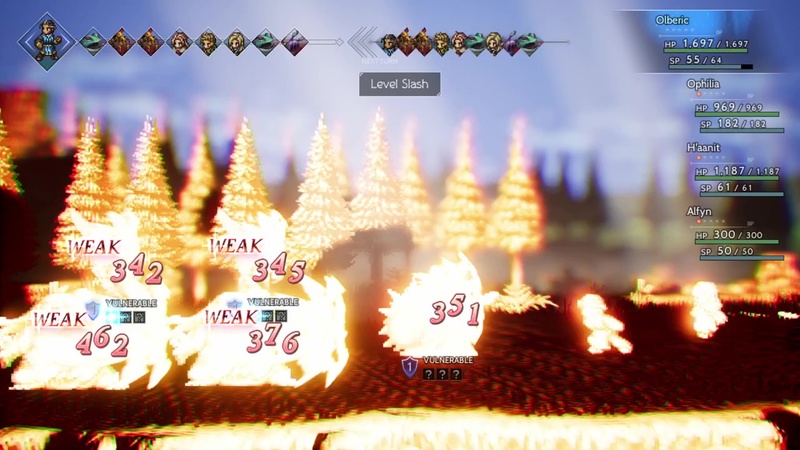 The familiar map overview and easily digestible mission structure both help make Octopath Traveler remarkably easy to play. Those who want to level up their heroes need only seek out the nearest unexplored passage or instead find a nearby path with a danger level slightly higher than the characters' current levels. Similarly, jumping to the next story element is as easy as traveling to green-hued cities on the map, then choosing to continue the chosen character's next chapter. Aside from sitting through extended dialog sequences, players will be spending the bulk of their time with Octopath Traveler in battle. Thankfully, Square Enix has found a way to keep the old-school turn-based style of combat fresh with a few easy-to-understand tweaks: each character can choose from a selection of different weapons that can be hot swapped in battle, and each of the characters' different abilities can be powered up through the use of Boost Points. These powerups become both crucial and strategic: by pressing the right bumper, players can augment attacks to strike up to three additional times or add strength to their physical or elemental attacks. Enemies have specific weaknesses, so sometimes it's best to use Boost Points with specific weapons to break their defenses and remove them from the battle order; other times its more beneficial to wait until their defenses have already been lowered before using Boost Points to augment the party's attacks. Boost Points can be used to augment just about any type of ability, and using them in conjunction with specific weapon types and against specific weaknesses is just plain fun. Sometimes players encounter a group of flying foes weak to bow attacks, and instead of saving up Boost Points and attacking each in order, a single Boost Point can be used with a widespread arrow attack to break multiple enemy defenses or even kill all enemies at once. Though easily learned, the strategic options are substantial, and learning the intricacies of the otherwise simple battle system has proved to be a constant source of entertainment. Of course, there is a fair amount of plot and character intrigue inherent to the Octopath Traveler experience — I'll save those thoughts for my full review next week. However, RPG fans with old-school mindsets should find the story to be adequate: most characters feel like they've been seen before in other titles, with genre tropes like pious white magic practitioners and cocky-yet-good-hearted thieves making their usual appearances. It's slightly too soon to make a definitive recommendation, but Octopath Traveler certainly seems to be living up to the buzz. Gamers who aren't particularly thrilled the JRPG genre might not find too much to get excited about, but players who fondly remember the 16-bit era will be stunned with how well the old-school formula translates into a modern medium. Keep on top of the Octopath Traveler launch and all other upcoming games by checking out our complete schedule of 2018 video game releases. Sounds great, but switch only? You say that as if it's a problem? can I play the role of nintendo switch snob and say those PC games would be great if they were on switch? I wish we could get a review before it comes out next week. I'd like to get a preorder price- but if it's 300 hours of random battles I'm not touching it. Seriously is Square putting review embargoes on it until it releases? There is a prologue version up on the store right now you can try. It gives you three hours of play time so you can at least get a taste. I played about ten minutes so far... i is super JRPG so far. Haven’t seen any combat yet. It reminds me of old style 16bit jrpgs and I like it. I’m with you on everything except Nintendo games. They generally hold their value and resell very well. It definitely has random battles, but I don't think you'd reach 300 hours play time unless you really, really liked the game. From what I've seen so far, each character chapter is between 60 and 90 minutes long.